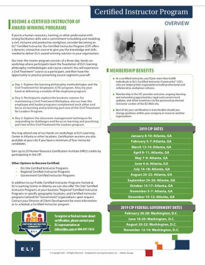 To become an ELI Certified Instructor you will need to attend the Train-the-Trainer workshop. During this three-day, hands-on workshop you will learn the foundation of ELI’s training philosophy, methodologies, and course content. February 26 – 28: Washington, D.C.
June 18 – 20: Washington, D.C.
August 20 – 22: Washington, D.C.
November 12 – 14: Washington, D.C. In addition to our Public Certified Instructor Programs hosted at ELI’s Learning Center in Atlanta, we can also offer “On-Site” Certified Instructor Programs at your location as well as “Regional” Certified Instructor Programs in specific geographic locations and Certified Instructor programs tailored for “Government” organizations upon request. Contact your Director of Client Development for more information or to schedule a Certified Instructor program.